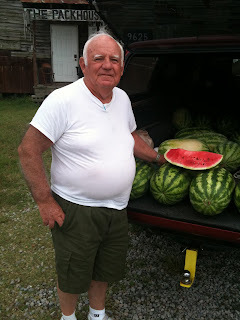 He does most of his business in a county with one of North Carolina's highest unemployment rates, but William Joyner says sales of his watermelons are strong as ever. Each summer, Joyner sets up shop at the same spot: the intersection of Kingsboro Road and old US Highway 64 in western Edgecombe County. We were there to shoot some video for an upcoming Patchwork Nation report when we met Mr. Joyner and asked the question just about all business owners are being asked these days: 'How have your sales been?' 'Never better' was Joyner's immediate reply. Out-of-state visitors are stocking up on their way to the beach; long-time residents who work at the nearby QVC distribution center are stopping by for the summertime treat on their way home in the afternoon. A full watermelon is going for $7 and Joyner's selling canteloupes for $2.50. Even in the midst of the worst economic times in decades, cooling off with a slice of watermelon is something plenty of folks think is worth paying for...seeds and all. Home to large pockets of black residents but a below average percentage of Hispanics and Asians.